While She Sleeps have released a lyric video for their new track Civil Isolation. It’s the first taste of the follow-up to 2015’s Brainwashed, with an album title and release date still to be finalised. 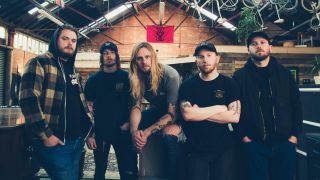 The band checked in to say that while working on the new material, they decided to change up the way they’d previously worked – with Civil Isolation capturing the mood while recording. They say in a statement: “Before we began writing the new album, we decided to create an environment where we could express ourselves and explore new ideas without feeling trapped or confined by rules, regulations or deadlines. “We transformed an old warehouse in the industrial heart of Sheffield into our new home. This song encompasses our views and experiences, breaking from the conventional model and creating a new ideology that works for us.